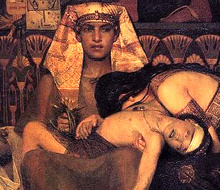 All of the first born- the deemed priests of Egypt- had to be killed. YVWH had to show that the lineage or succession of their god and priesthood was nothing compared to HIM (in the eyes of the Hebrews). The first born got the choice of food over the others of the family. The first born would be the male since the female was not counted. It did not have to be all the first born everywhere only those close to the ruler. If the ruler first born died, and those of his priest and those of the royal guard it would be seen as an act of a powerful God. It would have been a slow poison something like Lead Arsenate which is a naturally occur metal. When mixed into meat stew it goes unnotice. In the tombs of Egypt, paintings nd mosaics show the first-born offering food to the gods on behalf of the ancestors. The link to the ancestors and the gods is broken.